In 2016 Zenith Music and Snadens Pianos celebrate the 10th year in our relationship with Fazioli. Beginning with the sale of our first Fazioli to the University of Western Australia School of Music we have seen these magnificent grand pianos enhance the musical culture in many homes and institutions around Australia, including the Western Australian Academy of Performing Arts, St. George’s College in Perth, the Sydney Conservatorium of Music and many high schools renowned for the quality of their music programs. As you can read below, Fazioli is a piano maker of great passion and has developed a tradition of high quality, consistent, refined and beautiful instruments. 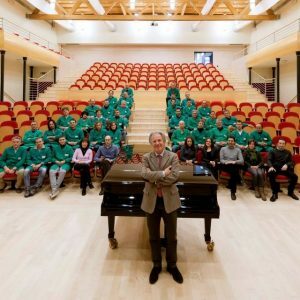 In keeping with the high standard that has come to characterise Fazioli, Zenith Music and Snadens Pianos pride themselves on having professional, knowledgeable, passionate and friendly staff including technicians who have undertaken advanced training in order to take care of each and every Fazioli we sell. We are proud to partner with Fazioli in Australia. 2016 marks another milestone in the rise of Fazioli with its inclusion in the 2016 Sydney International Piano Competition of Australia. Under the direction of Maestro Pierce Lane, Fazioli was invited to join the competition this year and they were eager to accept the invitation. Working closely with Zenith Music and Snadens Painos the Fazioli F278 concert grand piano will take its place in yet another acclaimed international piano competition. Fazioli has been producing grand and concert grand pianos since 1981. Passion for music and scientific knowledge, artisanship of the highest level, a firm commitment to technological research and strict selection of the finest materials: these are the main elements required for the production of a Fazioli piano. The Fazioli factory is located in Sacile, 60 Km (35 miles) northeast of Venice, in northeastern Italy, an area renowned for its ancient and prestigious tradition in woodworking. Sophisticated manufacturing techniques, cutting-edge technology, woods of the highest quality and first-rate components are used by the Fazioli technicians, a group of highly qualified and committed artisans, who work passionately each day to create their works of art. The entire production process, from the initial material selection to the finished product, takes approximately three years and 1000 hours of highly specialized artisan work. The famous Juilliard School, New York, has recently bought a Fazioli concert piano. For the first time this institution – which is considered among the most important in the world for high-level musical training – has broken the monopoly it had with another historic brand for more than 80 years. The Fazioli pianos are on stage also at prestigious theatres, as the Teatro La Fenice in Venice, the Palace of Arts in Budapest, the Beijing Grand Theatre in China, to mention just few of them. The Fazioli “institutions’ list” includes a remarkable number of schools, like the Paris Conservatoire, the Music Departments at the Universities of Vienna, Graz and Salzburg, the Colburn School in Los Angeles and many others. The Purcell School in London has been nominated as the first “Fazioli Centre of Excellence”, as it is provided with Fazioli pianos in its performance rooms.